History - INTERNATIONAL COCKSHUTT CLUB INC.
Cockshutt Farm Equipment Limited manufactured and sold high quality farm machinery across Canada, several American states, and around the world for more than 85 years. It all started because a young man had a dream that he could make better plows. The young man was James G. Cockshutt, son of Ignatius Cockshutt, a wealthy merchant whose high principals and astute financing, contributed to the success of the company. To his initial dream, James added energy, innovation, and pride of workmanship, resulting in the production of superior implements for Canadian farmers. 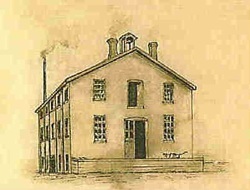 James Cockshutt opened up his little shop, called The Brantford Plow Works, in 1877, producing stoves, scufflers, and walking plows. He said he would make every item so well that its reputation alone would make the company grow. The next year he purchased a license to make the Wiard Junior Malleable Beam plow which the company sold, unchanged, for 53 years. James began to invent new models with more efficient chilled iron mouldboards and shares. Five years later a sales brochure stated that The Brantford Plow Works was the only plow maker in the Dominion who have yet sold or exhibited Sulky Plows of their own manufacture. One model, the J.G.C. Riding Plow, was so popular that it became known as the plow that opened the west. Unfortunately James died from tuberculosis a few months before his J.G.C. patent was registered. His father, Ignatius, stepped in as Vice-president, and his brother, W.F., became President of the renamed Cockshutt Plow Company. The reputation of its products quickly propelled the company into a leadership position in Canadian industry in the late 1800's. Every year new products were added, large factory expansion was required, the number of workers increased, and still they could not fill all the orders. In 1888, W.F. went back to manage his general store and the next brother, Frank, took over the Plow Company. A new factory, completed in 1903, covered 23 acres, and was reported to be the most complete plow factory in North America. One of the company's high volume lines was the Engine Gang Plow designed specifically for the huge steam engines and almost as large new-age gasoline tractors. These were the first successful gang plows ever built and were in great demand both north and south of the border for breaking prairie sod. Up to this point the Cockshutt Plow Company had been family-owned, but they no longer had enough capital to continue expanding. That's when Harry Cockshutt, the youngest of James' brothers, took over as President. First he put new financing in place, which enabled the company to purchase the Adams Wagon Company, Brantford Carriage Company and a one third interest in the Frost & Wood Co. Suddenly Cockshutt Plow became a full-line company with many more products, and a stronger dealer organization. Through World War I, exports improved and the company built on the earlier strength it had in England, Scotland, Australia, and South Africa. When the depression hit and the west was stricken with drought, rust and grasshoppers, sales hit bottom; but because they had been thrifty in the good years, CPCO had enough cash to survive and in fact still had very little bank loans ten years later. Two new products helped them through the rough times. The first was the Tiller Combine. A cross between a disc plow and a one-way disc with a seed box attached. The Tiller Combine was the West's first minimum tillage tool - about thirty years ahead of it's time! Very soon it was proven that by not plowing or cultivating, moisture could be saved and less topsoil would blow away. Planting in the spring with the Tiller Combine saved the farmer at least 60% in fuel, repairs, and time. The second addition was an arrangement to distribute Allis-Chalmers model 20-35 and United tractors. In 1935 Cockshutt took on the Oliver tractor line. Because of strong ties to Great Britain, Canada entered the war in 1939, and promptly converted to making munitions. During the war Cockshutt was one of the first companies to hire women to make aircraft wing and tail sections. Cockshutt was also the first company in Canada capable of forming and welding deep-draw aircraft manifolds. The most interesting wartime products were the plywood fuselages for Anson bombers and Mosquito Fighter/Bombers. Other wartime products included a variety of truck bodies, ambulances, gun trailers, and hand grenades. In 1941 Cockshutt introduced a new concept in swathers. Early swathers were built like battleships - cumbersome and so heavy they could not go into wet harvest fields. Because it was super-light the Cockshutt No.2 could get into wet fields which would then dry out quickly so the combine could have the grain in the bin before the neighbor with a heavy model could even start. It wasn't very long before Cockshutt had 60% of the swather market. The Wartime Production Board allowed Cockshutt to increase their engineering staff allowing the design and testing of self-propelled Harvester Combines and tractors. 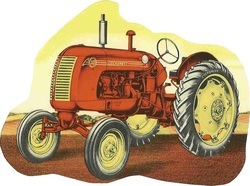 The state-of-the-art Cockshutt 30 tractor, the first modern production tractor built in Canada, was also the first tractor in the world to be equipped with Live-Power-Take-Off. LPTO made the farmer's life easier because it reduced plugging of balers, swathers, mowers, pull-type combines and other pulled implements. Driven directly from the flywheel of the engine, the power shaft continues to deliver full power to the pulled machine even when the forward motion is stopped. It's that simple - and Cockshutt did it first! Eventually everyone copied the system and today no one even remembers the problems of the old clutch-activated power shaft. Next to the smooth-styled 30, Cockshutt added the little 20, and the larger 40's and 50's. As I'm sure you know, many of those 40's and 50's are still showing off their super-strength bull gears and transmissions, at pulling competitions, equipped with engines three times the power of the original. Cockshutt Self-Propelled Harvester Combines also made a good name for themselves. First with variable speed drives and bomber-style tires, Cockshutt combines put a cleaner sample in the grain tank, with less loss over the straw walkers. It was the combination of new combines and tractors that convinced the National Farm Bureau Co-operatives to distribute the Cockshutt line in the northern tier of American states. Lots of these Co-op tractors, now over fifty years old, can still be seen at daily farm work. This was the year Cockshutt introduced a full line of tractors in one season. Each size, 540, 550, 560, and 570, was totally new, - not just a face-lift. Raymond Lowey, the famous automobile designer, had crafted the 500 series sheet metal, setting a new standard in modern styling. Once more it was innovation, excellent engineering, and a keen marketing staff that allowed this little company to compete with the giants. Even the carriage and wagon business, under the name of Brantford Coach and Body, had grown to become the largest truck body and semi-trailer manufacturer in Canada. The company was on its way to bigger and better things, like Radial combines, and Hydrostatic tractors when it was suddenly bought out. Cockshutt did not fail - it was a victim of financial manipulators, through an unfriendly stock market take-over. New management promptly sold the farm equipment division to The Oliver Corporation, which soon changed the Cockshutt name to White Farm Equipment. Brantford Coach & Body was sold to Trailmobile. After 85 years as a respected, and profitable industrial empire, designing innovative farm and truck products, the Cockshutt name was retired. Never the less, Cockshutt products have made a huge contribution not only to the expansion and profitability of western farming, but also to the industrial development of the Dominion of Canada. For many it was a family place to work, with nice people and honest principles. Still today the examples of its products and contributions to the less fortunate stand as memorials; both to the enterprise and generosity of the Cockshutt family, and those who worked with them. The International Cockshutt Club is doing a great service by promoting the preservation of Cockshutt equipment, and by honoring the name and the accomplishments of its people.